Knitting (or Crocheting) for Profit? I’ve often been asked – quite a lot – how can a stay-at-home mom make money without having to leave their home? We salute all mothers who’ve decided to stay at home to take care of their family, especially their children. There’s no bigger sacrifice that anyone could’ve made, and for that, you have our respect. While we all know that household work is no JOKE, and sometimes, (okay, not sometimes, maybe most often), we’d also want to make make a little bit of something so we can buy ourselves and the kids something everything now and then. I’ve been telling this to everyone I know – you can make a living, and you don’t even have to be in the big, corporate world. No – you don’t have to do that. We admire those tough women who make a big career in the corporate industry, don’t get me wrong. So, back to the question, can a SAHM, plain housewife, or however you wanted to call it earn a living? YES – the good thing is, it can be your hobby! Think of it this way – what are the things that you like to do? What makes you feel accomplished? Can you cook? Can you bake pastries and cakes? Think of one thing that you’re good at and pursue that passion! On one note, there’s a booming industry and it’s making a lot of money – crocheting! YES – you can find it everywhere, and the demands are surprisingly HUGE! But Aine, I don’t know how to crochet! Sure, I’d love to learn, but where do I start? That’s the question isn’t it? To tell you frankly, I have very minimal experience and knowledge with knitting. I did a couple of those small projects way back in High School, but that’s just about it, until I’ve read this ebook: Knitting for Profit. Of course, I did my research, learned the basics, watched YouTube tutorials, and that’s where I started to enhance my skills. Now that I know how to knit, what’s next? The eBook showed me exactly the steps that I should follow, and sure – it helped me turn that past time into something lucrative. I admit, I’m not making thousands or millions from it. I haven’t had sat down for too long doing projects, but it sure helped me make enough money to buy myself a couple of “unnecessary wants” (if you know what I mean 😀 ). I exactly did all the outline in this sweet, sweet, eBook, and voila! It’s not a “get rich quick scheme”. No no, there’s no such thing. But this guide will tell you exactly how you can turn our past time into a growing business. If you want a copy of the book, you can get it HERE. I’ve given my friends copies of the book, and guess what? They loved it! Here’s your chance! It’s a hobby. Nothing to explain here. Take it as an advantage. Your kids will get the chance to wear clothes, hats and even accessories that you made yourself! You’re not obliged to work 8 – 12 hours a day. In fact, you can work on your own hours! There’s nothing to lose, and you’ve got more to gain. When you have the time, and if you want to REALLY do something, then this book is definitely worth checking out. Be able to start a successful and lucrative crocheting business. As a matter of fact, 95% of individuals who usually get started small “usually” fail on their first 6 – 12 months. 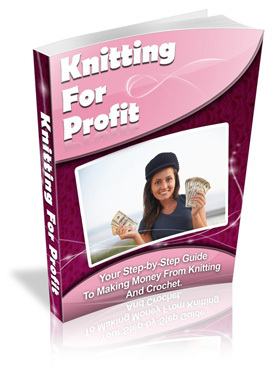 Now, this ebook will help you become part of the remaining successful group, and help you make more money in your crocheting business until you want. life. Don’t have an idea on what to sell? Don’t worry – this book has it covered. This eBook even gives you some great examples on which products work well, and which ones are in demand in the market. Assuming that you don’t know how to knit, does it mean that you can’t take advantage of this business? DEFINITELY NOT! You’ll learn how you can start selling, even without having products of your own! You can save a lot of time. Spare yourself from all these expensive mistakes. If you’re serious about your knitting business, then you should read this book!